(arrow) Slides the seat forwards or backwards. Lift up the lever and move the seat. 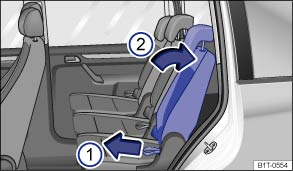 The seat must engage in a position. Adjusting the backrest. Take hold of the seat backrest at the top and pull and hold the loop at the side ① in the direction of the arrow. At the same move the backrest into the required position ②. Let go of the loop. When a backrest in the second row is tilted all the way back, a luggage compartment cover fitted behind it may be damaged. Remove the luggage compartment cover before adjusting the backrest. 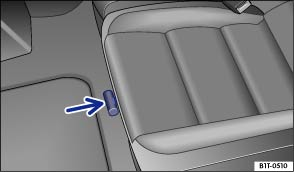 Items in the luggage compartment could cause damage when pushing the rear seats forwards or backwards.